and i decided i wanted to paint something especially for her. So dear Greta i painted you ' the Fluffy family', i hope you like them. Wishing you all a happy weekend ! Absolutely marvelous family rendering. We are all different, viva la difference. And you may know, I love the black sheep. Your friend will love this forever. i like this alot. they carry expression that immediately lets you into their characters. well done! Renilde! What a beautiful family portrait! And your words for Greta are so sweet. She sleeps now but I will make sure she sees it in the morning! She' going to LOVE it. I love your family portrait! All gathered: from the patriarch over to the baby and, of course! to the black sheep of (the) family - great! And your sister as a cat close to you... very cute (and deep). 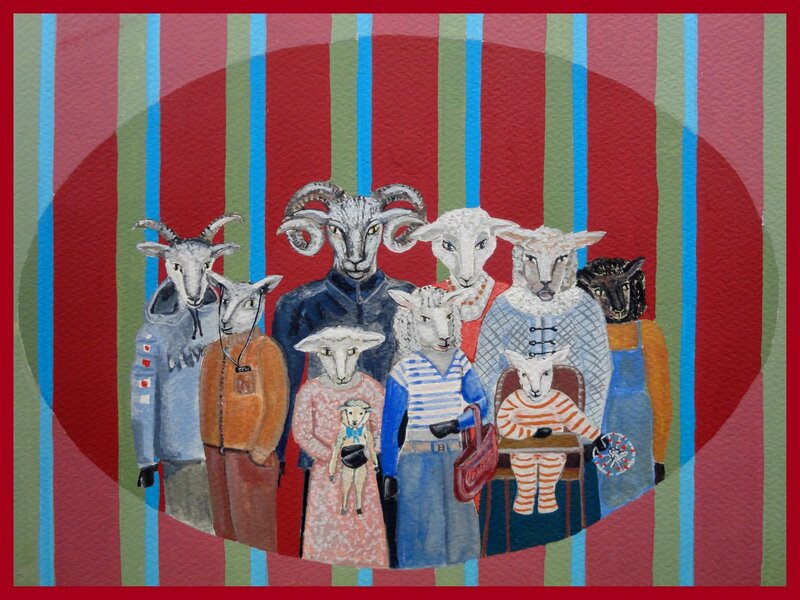 Dear Renilde, love your collage and sheep portrait, those colors look amazing in your painting!